I arrived at the barn last week and only Zorra was there to greet me. I’m not entirely sure, but I don’t believe this has ever happened. Zorra is down the lower end of the pecking order and usually moved off quickly by Audelina or Montaro. But on this day, all the others watched me come in, but they stayed out in the field – also very bizarre since I usually give them their alfalfa or feed first, so they normally all head for the paddock as soon as they see my truck. Zorra has not invited me on her back for about 2 years now. We have been walking a path of healing together for her past riding trauma, but we are not done yet. Every so often, I am overcome with longing. I know she doesn’t want me on her back because it triggers old trauma and it hurts. But I do so love consensual riding where we become one body linked together with each other and the earth. Zorra walked up beside me and then turned her body away from me and backed her rump up against my legs. “What?” I said teasingly, “You want me to sit on your rump? I can do that, even thought it’s going to feel pretty weird for both of us.” As I spoke, I started scratching her dock and then realized that her lumbar and bum muscles felt pretty tight, so I switched to massage. As I massaged her from behind her rump, I was looking down upon her back and withers. As I thought about myself sitting near her withers I started to get this strange, squiffy feeling and then it felt a bit fearful for me. I realized I didn’t even want to sit on her back as it didn’t feel safe. I thought, “Wow, I must still be freaked out from Jax biting my head.” Because I’ve been riding since I was 2 years old and Zorra is one of the safest, calmest horses I’ve ever ridden. When she gets scared, she doesn’t spook or bolt, she plants and looks/studies the scary thing. She’s also very caring – one time she witnessed me being bucked off another horse (all my fault and I totally deserved it) and she was really upset about it. At that moment, Jax and Juno walked into the barn. Mystifyingly, Audelina and Montaro continued to stay out in the field. Jax and Juno said a brief hello, stepped up onto the side wing of the barn and immediately dropped into meditative state. Juno’s head was facing Jax’s rump and he had his nose in Jax’s flank. I’d never seen them meditate like that – pressed close together. Jax invited me to join them. 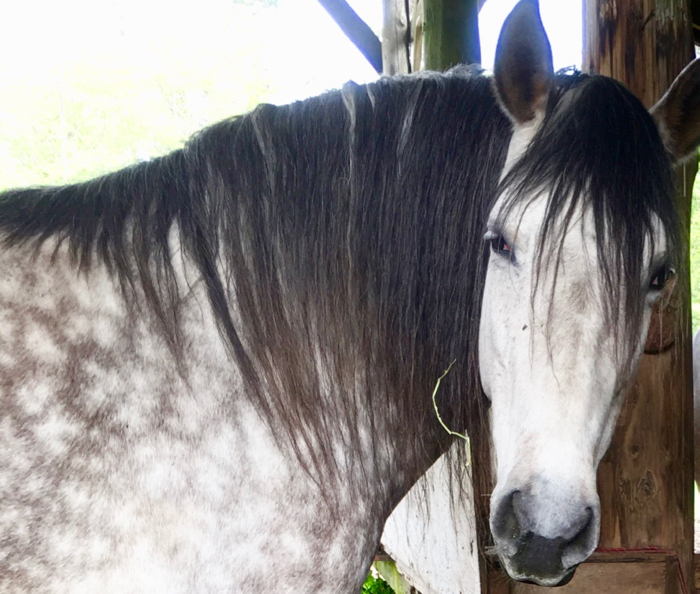 Understanding seeped through me; especially poignant due to the experience I’d just had with Zorra – standing behind her, thinking about riding and then feeling all fearful and wiggidy. Obviously, those were not my feelings as I sent Zorra the image of me on her back, they were hers. My question to Zorra, of ‘Why? After all this time and all this healing, building muscle and strengthening, why do you still not want me on your back?’ became crystal clear. But imagine if he’d seen this as a process and started by just nuzzling my ears, nuzzling the back of my head and breathing onto my neck as we meditated together. What if he took weeks and months to help me feel totally comfortable and safe with him using his lips and teeth (ever so gently and respectfully) on parts of my head. And never once hurting me. And stopping immediately if I didn’t feel comfortable. Or stopping for months or years if I said, “Hey, this head thing of yours is really weird, I don’t like it.” And then slowly, slowly, progressing to taking my head in his mouth – still sounds bizarre I know, but let’s just pretend that’s our weird way of connecting and sharing love. IF he did all that, and approached it that way, would I still have experienced primal terror? I don’t think so. In fact, I’ve seen this – once with a man and his bear and another time with a man and his lion – and both men showed only happiness as the bear or lion took each man’s head in their jaws. As we meditated together and all of this understanding seeped in, I realized I needed to do an EFT Tapping session on releasing this primal trauma from Zorra. And my way in to understanding the depth of that experience would be informed by my own experience of Jax taking my head in his jaws. Because the feelings, the experience – mentally, physically, energetically – is the same. It’s also interesting that Jax taking my head in his jaws left no visible bruising or swelling on my head or skin. So when we ‘break’ a horse to ride and we don’t see any visible bruising or swelling from the saddle pressing down, the cinch cutting off breath, our heels digging in, the mouth or nose being pressured, and the neck cramping or spasming, we think the horse is just fine and that we are being gentle and humane. You can’t see soreness or tenderness. The points on my head where his teeth gripped were tender to the touch for almost 10 days – and were an ongoing reminder of my vulnerability. Zorra has thickened tissue where the dressage rider dug at her sides – she was ‘only’ ridden a couple times a week for 3 months. But her body armored against the assault. And even though she was ‘broke’ to ride by a Natural Horsemanship trainer, who worked slowly, used pressure-release and made the right thing easy, he never once asked permission. Or asked if she was enjoying herself, or let her be in charge of the day. Of course, as I prepared to do the EFT Tapping session for Zorra and me, I realized that this gift must extend out to all horses and their people. So I used open-ended language in the video and I instruct you how to surrogate-tap for your own horse(s). Even if you never plan to ride your horse again, I encourage you to tap along and release this deep-seated trauma from their cells, tissues and consciousness. I have no idea if Zorra will ever want to be ridden again, but I know that doing this healing will only benefit our relationship. Likewise, if you run any kind of horse sanctuary – or visit one – it will be a tremendous gift to tap on behalf of all the horses there. I would love to hear what comes up for you as you do this tapping session. It may take a while for any changes or release to show up in your horse(s). And this may also pave the way for another piece or layer of healing to come forward – we’ll just keep peeling the onion! In the first part of this story, I told you that even in the midst of the trauma, I intentionally ‘opened to whatever healing was present for me in this moment.’ And in that first week, I noticed that my upper palate in my mouth had widened. And I also had a lot of soreness in my temporomandibular joints (TMJ) on both sides, even though his teeth were nowhere near those joints. Well this week, I discovered Jax had given me a most precious gift: I could sing again. Driving home in my truck, I began singing along to my playlist. After about 10 minutes I realized, “Wait a minute, my throat doesn’t hurt…wtf??! !” I have no idea what caused it, but about 6 or 7 years ago my throat (near the top, towards the back) began to ache and then hurt whenever I sang. It hurt enough that I stopped singing. I could hum just fine, for as long as I wanted, but the days of singing with abandon were over. I went to various therapists and voice coaches, but there was no change. A couple years ago I bought a fabulous DVD program by Per Bristow, called Sing With Freedom, and that helped, but there was still a strong achy soreness if I sang for longer than a few minutes. About a month previous to Jax biting my head, I had attended a spiritual Vocal Journey with music therapist Amit Carmelli. I felt things loosen and shift during that experience and my throat stayed looser, but still a bit sore, for a few days, then back to its regular soreness and ache. I’m not willing to have my esophagus scoped, so that was that. I sang for 30 full minutes as I drove home – just like when I was 9 years old standing on the platform at the front of the church, singing loud enough so the person in the back pew could hear the words. And no ache, no soreness, no pain whatsoever. In fitting tribute, I sang Etta James’ Out of The Rain as the dogs and me flew down the back roads. I was kind of afraid to test it again, in case that was just a fluke. But when we had family and friends over for a big Thanksgiving dinner, we ended up circle singing and belting out other favorites as the evening wore on, and again, no soreness whatsoever. And we have this amazing, powerful gift for horses worldwide, to be healed from a foundational, core trauma (the EFT Tapping video). So it’s kind of like someone who goes on a Healing Journey from cancer, or colitis, and they say, “This disease is both the best thing and the worst thing that ever happened to me.” And maybe that’s what true evolution is about – where we move out of the realm of good and bad, black and white, and we begin to see everything as a palette of colors. Red is not better than blue; it’s just different. I could have interpreted this experience as a terrible trauma (red) or I could surrender to the multi-faceted kaleidoscope of messages, feelings and mind/body healing woven throughout this experience (blue, green, purple, red, yellow). And how could our world shift if we opened to simply experiencing each and every color? Without judgement, without fear or bracing – but with ultimate trust in the abundant love of the universe…? ← Winner of Looking For Horses CD Album! I have been on a horse journey for over twenty years now, coming very late to horses though I had always loved them from afar. I am now 66. Always a nervous rider, always looking for ways to be ‘better, better, best’ in everything I did, ‘finding’ many trainers and teachers along the way, I now find that my horses are purely ‘my friends’ and YOU are the only one I really pay any attention to when you speak about your ‘horse adventures’. Thank you. Awww thanks Jan – that’s a pretty strong endorsement for me to keep sharing my stuff, no matter how “out there” it gets! I’d love to hear if there are any changes in your horses, or shifts in your relationship after you do the tapping video for them. I find the ‘group consciousness’ around this stuff the horses are doing just fascinating 🙂 Oh, and post a pic of your horses if you get a chance. I always love to connect with our precious community here. Jini, please never give up sharing your ‘stuff’ PLEASE! I will try the tapping video, because one of my horses is ‘difficult’ for me to do ANYthing with . . . things which are for his own benefit, but that are different in the slightest to the usual routine with absolutely no expectations. I mean cleaning his hoofs! He had developed some cracks which need treatment, and he is perfect for my hoof trimmer, perfect for me if someone is actually holding him but I cannot tie him up (something I prefer not to do anyway, but thought it might help so I could get to his feet) and if I put the halter on and stand on the lead rope while I am doing his feet, he is not too bad. However, to get him to even pick up his feet is a struggle. He will actively put all his weight on the hoof I am trying to lift, by lifting the opposing one! What I cannot understand is that he is so good for anyone else dealing with his feet, with me at his head, but not me. He is a standardbred who likely raced, but in the six years I have had him, like you with yours, he has known nothing but fairness and kindness and almost no riding. He seems not to even want to interact with me, just eats and leaves. My appaloosa is the opposite and thrives on any sort of attention. He is definitely not ridden as he has ringbone but manages quite well. Thanks for chatting! Hi Jan, it can take a while for the energetic healing to filter through to the physical body, and other times it can be very fast. Also, this tapping may only be 1 layer of the trauma a horse has undergone. There may also be physical issues that need to be healed too. Or the back muscles need to be strengthened before the horse can carry weight without pain. Or the horse is actually protein-deficient and cannot build that muscle, and so on. Thanks for the tip about eyebright – I will try that! Yep that pretty much describes the state I’ve been walking around in! And this is just pure gold: “astounded, lucid, confusion”. YES. These magical, powerful beings – what they bring us to!! Thank you Jini for your stories…wonderful..
Hi Jini, Like Sheila I am gob-smacked and this was the case in your last posting as well. I am in the middle of a move to a very rustic cabin in the woods on the farm where my horses are boarded. Up until now I I have been living in town in the house that I sold two years ago. Never in my wildest dreams did I think I would still be renting here instead of living on a farm with my horses. 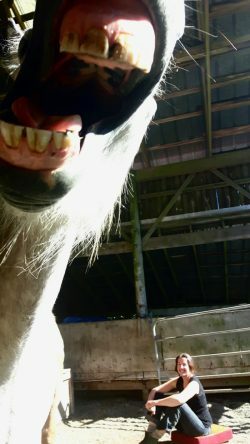 I sent a response to your post about a year ago that I was still searching for a farm to run an equine business and that bizarre circumstances kept arising to prevent a farm purchase. A year later and several near-purchases and/or farm shares later I decided it was time to shift some energy and to make a move to where I will be on the same land as the horses. To make a long story short I cried through most of the tapping with you after I read part one of “Head in Jaw..” and I continue to be in gratitude and in awe of the resonance that I have with your journey. So many parallels!! I love the message you received from Jax and am looking forward to listening to your latest tapping. Between listening to the recordings from the 2017 Symposium and your postings I am staying grounded in my process and am learning so much. I can’t thank you enough for your deep sharing. I have not heard anything about how Diedre is doing. Are you able to share or to pass on my love and appreciation to her for the great interviews? If you scroll down, there is a bar that says: Subscribe to Updates and that will keep you in the loop and allow you access to details of her Healing Journey thus far. “…from my experience the state of shock creates the fertile soil for manifestation.” Her journey is just a series of bizarre circumstance like you mentioned that then lead her to the next piece, but she too does not have her own land yet – despite having money to purchase it. It seems her horses or the universe need her to go on a journey first – so she keeps moving from rental place to rental place as guided. It is all just fascinating to me. And now that I can spontaneously feel gratitude (!!) I am finally at peace with my own situation and able to enjoy being here, whilst being gently curious about what the future holds. Now I have a question for you: Are you getting shift from just listening to the tapping vidoes? Or are you also tapping along? 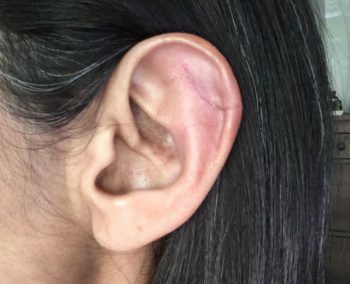 Jini….Loved reading about your continued healing/learning in regards to your bite on the head. I find it so fascinating that it continues to open you to new realizations and help you discover and process. I have explained to you many times of how much abuse I think Bullet has gone through. From past trauma before he & I came together and regrettably some from myself also (even if unintentionally/ignorantly) He has expressed so strongly and consistently that he does not want to be ridden. I feel your analogy of the lion on the back and even much deeper the bite to the head were very powerful for me to help me see his side with much more clarity. I actually quit riding him close to 2 years ago but at the same time kept that hope & try & want that he will/would someday invite me and be ok with me on his back. The last year has been much easier to except his “NO” and mostly ….let go,…because Dreamer came into my life and his opinion/attitude towards riding is completely opposite and he seems to enjoy our outings quite a lot and even sends riding energy/thoughts my way sometimes…as if to inniciate an outing. 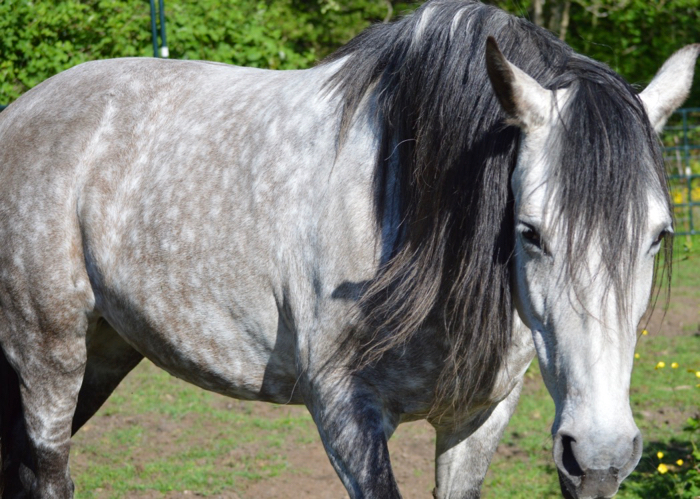 It seems to happen when he’s bored, because he is only on 12 acres and although I am so thankful to have it….I know it’s not enough to keep him stimulated at all times….he’s also 1/2 Arab so has lots of desire to go and get out. I know his attitude is probably on the rare side among horses and I give his previous human in life all the credit she nurtured an amazing horse. I am so grateful to & for him everyday. He is a gift to me for sure and I appreciate him with every fiber of my being. I just wanted to say that this helps me even more …to understand the feelings Bullet has and his unwavering desire to NOT be ridden. I love and value all 3 of my horses and even though Bullet & Banner will probably not be ok with being ridden ever again physically or mentally they still give so much to me and are also true gifts to be able to share my life with. I will be doing the tapping for sure & just want you to know that your openness is so deep felt. Also on an unrelated note …..looks like you cut your hair? & it looks great✌?️❤️? I love how you are able to take what message they give you and put it into words. I have been on a journey like no other for the past 12 or so years. It all started with my mare. She is 15 and been by my side since she was 9 months. I have done all the training so I take full responsibility for our relationship. I really haven’t ridden her for the last 2 years. She is ride-able, however I have not had the spark to get on and I think I know why now. She has never really wanted me on her back. I have had times that I have planned on riding and she moved so much in the crossties I took that as a definite NO! So I listened…I have done my own energy work on her and I am familiar with tapping. I will follow the video and apply it to her and see what comes up for us. She is very bossy with me on the ground and under saddle we are one. I want the same on the ground…I have hope. I will ask the question and wait for the answer. Beautiful Roxanne! I look forward to hearing what happens with her.